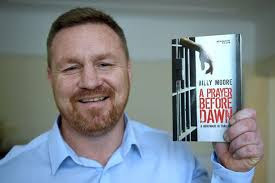 Posting this information because Billy Moore from Liverpool has inspired me to write my book about Ryanair which should be out by the end of 2017..Shocking account of Ryanair recruitment policy through Shell companies Crewlink Ireland and Workforce International which has and continues to wreck thousands of young lives which involves Suicide. Many involved are now worth €millions through Ryanair recruitment for termination which is still going on.Irish,UK Government's and Aviation Authorities turn a blind eye. The book will contain details Ryanair,Aviation Authority IAA and the Irish Government will try to ban which will Fail..Once you read this book "never again will you fly Ryanair..The real Ryanair chief Billionaire US David Bonderman TPG and Michael O'Leary have blood on their hands..."Doomed To Fail Mr O'leary"............... Fund Raising Auction for Billy Moore starts Sunday 7th August at 9.pm and ends Sunday 14th August 9pm.Many great items to bid on.All money raised will go to help Billy's holistic alternative therapies path to help him beat this cancer..Please all share this Auction on Sunday which will be posted on Billy's Facebook Page..